A highly enjoyable collection of short-stories featuring Golden Age era (though not necessarily genre) mystery and crime. The theme is crime that takes place in the sleepy hamlet and quiet village but apart from that there is a great variety of story here. 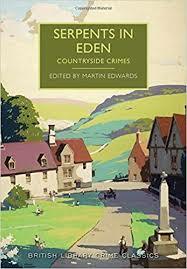 Some of the crimes being quite mundane too such as Margery Allingham's "A proper mystery" which involves a trodden down plot at a flower show. But there are also some rather more serious crimes such as in Ethel Lina White's very atmospheric "The scarecrow" about an escaped madman who is out to kill the woman he failed to before. My favourite though is E.C. Bentley's "The genuine tabard" about stolen historical artefacts and fooling rich Americans to buy them.